For additional future programs and events, please see our Parish Calendar. Join us for the Feast of All Saints on Sunday, November 5. Also, we set aside the upcoming month of November in particular to pray as a community for the deceased during Mass. So as you come into the chapel, please take a moment to write down the names of those whom you would like to be remembered especially in prayer this month in the parish's book of remembrance. At the end of November, we will make copies of the full list for anyone who would like to continue to pray throughout the year for those listed. 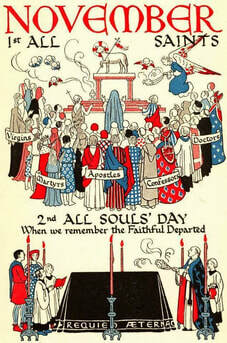 There are two days of the church year on which priests are encouraged to offer three Masses -- All Souls' Day and Christmas Day. Bp. Tim and Mtr. 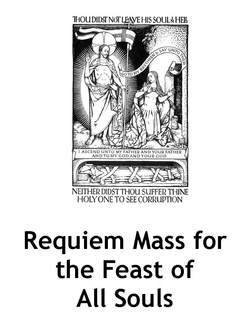 Lyngine will each be offering the three Requiem Masses on November 2, All Soul's Day -- if anyone has names of beloved deceased friends and family that you would like included in the intentions, please let Bp. Tim (stmikeandsttim@yahoo.com) or Mtr. Lyngine (lcalizo@gmail.com) know. Thank you for your generosity these past few weeks towards hurricane relief efforts in Puerto Rico. 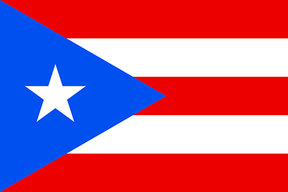 The members of St. Mary of Grace Parish have raised $530 as a community, which we have donated to the Puerto Relief Fund of Concilio. A very special thanks to Kristi, Hector, and Donna for providing information about the situation in Puerto Rico and relief organizations. 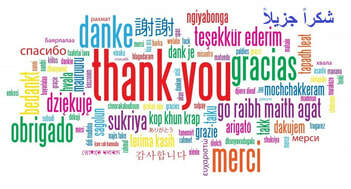 Thank you to all who brought food on short notice to provide dinner for the families without homes who were staying for the week at church as part of the Family Promise Program! The families and volunteer hosts very much appreciated the warm meal. 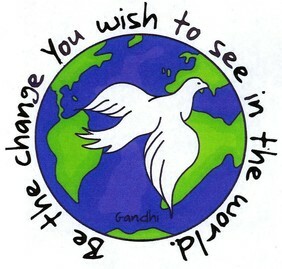 We will incorporate a virtual blessing of the animals into the St. Mary of Grace Sunday Eucharist on October 8. Although we can't have actual pets present, we invite everyone to please feel free to bring a photograph, toy, or other item to represent them by proxy as we offer a prayer. We will also be offering a prayer for our deceased pets.We will have a book of intentions in which people can write in their pets' names, living and deceased. 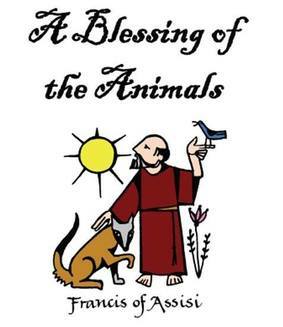 We would like to open this up to those who are not able to attend as well -- if you would like a pet, living or deceased, included in the St. Francis Day blessing, please feel free to let Bp. Tim or Mtr. Lyngine know their names. We are pleased to announce the ordination of seminarian Dave Wood to the order of Acolyte on September 24 at the 4 p.m. Mass at St. Mary of Grace Parish. Please keep Dave in your prayers as he prepares for this next step on this path to the priesthood. Join us as we help make large batches of tuna salad for Life Center of Eastern Delaware County, a local shelter for those who are homeless. We meet at a local home just 10 minutes from church to chop vegetables, open many cans of tuna, then mix everything together. We ask that each person bring three pounds of cooked elbow macaroni. Other ingredients (vegetables, tuna, etc.) will be provided. Please let Mtr. Lyngine know if you can help out and she can provide more information. This is the last Operation Tuna Salad for this year and in the upcoming months we'll be switching to Operation Spaghetti and Meatballs. An episcopal visitation is a bishop's official pastoral visit to a community of the Independent Catholic Christian Church. This is a time of shared prayer and reflection on the particular ministry of the community. Join us on Sunday, August 13 after Mass to pray and reflect on our shared life as a parish community. 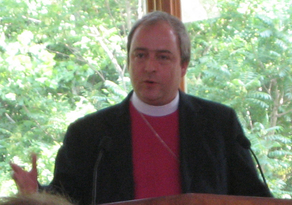 During an episcopal visitation there is a session with the community at large, with each cleric, and with each layperson who desires to meet with Bp. Tim. The purpose of this reflection session is to discern the community's hopes, dreams, and visions under the guidance of the Holy Spirit – and to prayerfully explore how the local community, clergy, and the jurisdiction at large and the bishop can work together to bring these into being. Join us every second Friday of the month, as we help make large batches of tuna salad for Life Center of Eastern Delaware County, a local shelter for those who are homeless. We meet at a local home just 10 minutes from church to chop vegetables, open many cans of tuna, then mix everything together. We ask that each person bring three pounds of cooked elbow macaroni. Other ingredients (vegetables, tuna, etc.) will be provided. Please let Mtr. Lyngine know if you can help out and she can provide more information. 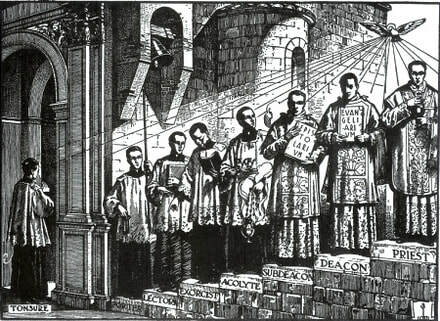 If you have been following our Facebook page you may have noticed that we have begun to post Sunday Mass online! Along with Facebook we are posting to our YouTube channel for those who follow us there. We invite you to pray with us using these videos and have a created a page on our website for this new ministry. Extra help needed for Operation Tuna Salad in July! Every second Friday of the month at 5:30 PM, we help make large batches of tuna salad for a local homeless shelter. We meet at a local home just 10 minutes from church to chop vegetables, open many cans of tuna, then mix everything together. Some of the usual folk who participate have family or work commitments for Operation Tuna Salad in July, so if anyone can lend an extra helping hand, it would be very welcome! As part of the service project, we ask that each person bring three pounds of cooked elbow macaroni. Other ingredients (vegetables, tuna, etc.) will be provided. Please let Mtr. Lyngine know if you can help out and she can provide more information. We invite parishioners to join in our annual all-church gathering as we come together as a church, to be with Christ and one another! During the weekend, we'll discuss where we have been and where we feel the Spirit leading us next as a church. There will also be daily Mass, opportunities to experience different styles of Morning and Evening Prayer, and a chance to meet and get to know other members of the Independent Catholic Christian Church. Please let Bp. Tim or Mtr. Lyngine know if you will be attending by May 12 so we can coordinate with the retreat center. We invite you to light a candle and enter any special prayer requests into the parish book of intentions that we will have available in front of Mary throughout the month. At the end of the month, Br. Bob will take the book and place it in his chapel so he may continue praying for the intentions written in the book. Operation Tuna Salad is back! Help assemble tuna salad for approximately 150 homeless individuals for the Life Center Shelter. As part of the service project, we ask that each person bring three pounds of cooked elbow macaroni. Other ingredients (vegetables, tuna, etc.) will be provided. Please contact Mtr. Lyngine for the location where we will meet to assemble the tuna salad. Don't forget to pick up your booklet of prayers for Easter! The Easter season (Eastertide) lasts for 50 days and continues until June 3. At the back of the chapel, we will have a booklet of weekly Easter prayers that you can use at home to mark and celebrate this season. The prayers are the same ones you will also hear us use at the beginning of Mass and can be a way to remember and bring the themes from Sunday into the week. Every Sunday beginning April 30, Bp. Tim or Mtr. Lyngine will be available in one of the side rooms for the Sacrament of Confession, Anointing of the Sick, blessings, prayers, and pastoral conversations. 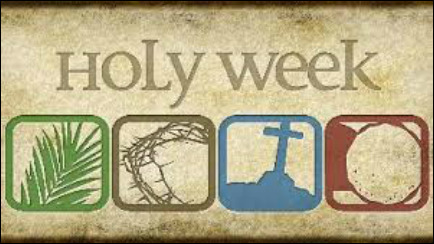 Not sure about coming to Holy Week Services? 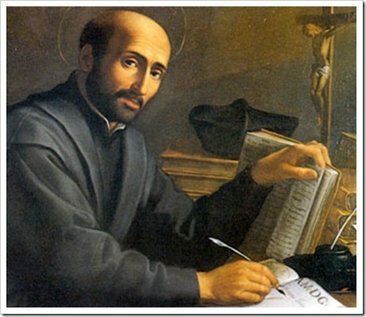 Elise Hudson will lead us in the Examen, a form of prayer developed by St. Ignatius of Loyola to reflect on the events of the day in order to be aware of God’s presence in one's everyday life. Elise will also share with us some of the apps she has found helpful for various forms of prayer, particularly in the midst of a busy life. If you have apps that you have found helpful, we invite you to share those with the group also! This will be followed by an opportunity for the Sacrament of Reconciliation/Confession and then Mass. Bring canned food and dry goods to Mass for the Media Food Bank! The Food Bank is located in Media, Pennsylvania and serves select regions of Delaware County. These regions are set by the government and include, but are not limited to Media, Upper Providence, Nether Providence, Rose Valley, Middletown, Bethel, Aston, Thornbury, Chaddsford, and Birmingham. Br. 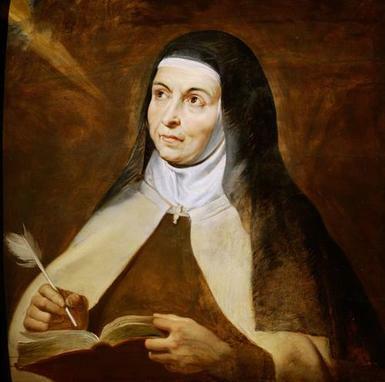 Bob will lead us in the Sorrowful Mysteries of the Rosary with meditations from St. Teresa of Avila, St. Therese of Lisieux (the Little Flower), and St. Teresa Benedicta (Edith Stein). This will be followed by an opportunity for the Sacrament of Reconciliation/Confession and then Mass. Sundays in Lent we will be offering an opportunity for prayer and the Sacrament of Reconciliation/Confession before Mass. This Sunday join us at 2:30 PM as we pray using the Gospel reading for Mass. We will be offering opportunities to pray the rosary, Stations of the Cross, and with the Scriptures throughout Sundays in Lent. Sundays in Lent we will be offering an opportunity for prayer and the Sacrament of Reconciliation/Confession before Mass. 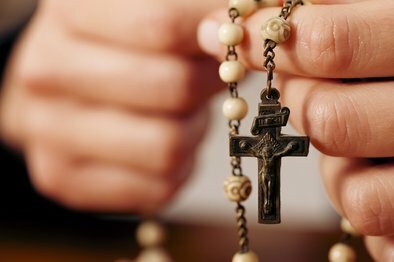 This Sunday join us at 2:30 PM for the Rosary. We will be offering opportunities to pray the rosary, Stations of the Cross, and with the Scriptures throughout Sundays in Lent. Sundays in Lent we will be offering an opportunity for prayer and the Sacrament of Reconciliation/Confession before Mass. 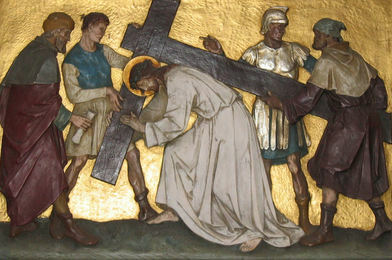 This Sunday join us at 2:30 PM for Stations of the Cross. We will be offering opportunities to pray the Stations again as well as the rosary and the Scriptures throughout Lent. Thank you to everyone who brought palms and helped prepare the ashes! 4:00 PM - MASS with burning of the palms. 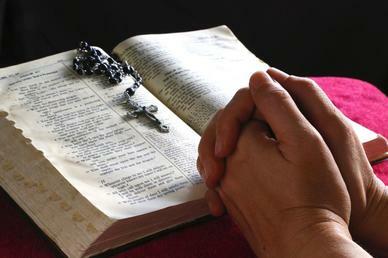 2:30 PM - EDUCATIONAL FAITH AND PRAYER SERIES: Preparing for a Holy Lent. Wondering what you can do this Lent to deepen your spiritual life? Come and hear what others are doing and get some ideas of what you may want to try this season. 4:00 PM - MASS with burning of the palms. Bring your old palm fronds and we will use them to prepare ashes for Ash Wednesday. 5:00 PM (after Mass) - PARISH COMMUNITY MEETING AND NO-COFFEE COFFEE HOUR. We'll be discussing upcoming plans and Michael H. will be presenting our community budget. We'll order some sandwiches from DiFabios for dinner or please feel free to bring other items if you would prefer. We have a number of events coming up and dates to save! Bring your candles from home to be blessed at Mass! 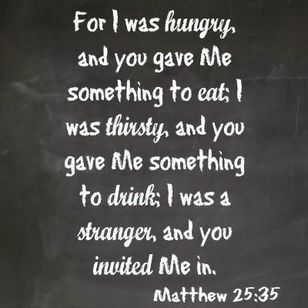 Help serve dinner at a local homeless shelter. There are a number of ways for parishioners to participate, including administering ashes. We will provide more background, training, and materials in the weeks leading up Ash Wednesday for those who wish to participate. This Advent we invite you to slow down, reflect on the season, and deepen your experience of the holiday season. 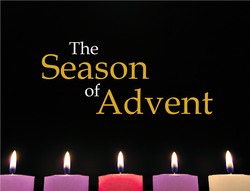 Sundays during Advent at 2:30 p.m.
Come learn about and sing some of the classic hymns of the Advent season. Use your imagination to enter more deeply in to prayer with stories in Scripture for the Advent season. We will be using Chapter 7 of The Word Is Very Near You by Martin Smith. The chapter can be read on its own. Mediate on specific words and passages in Scripture for Advent and learn how these passages speak to us today in quiet prayer. We will be using Chapter 8 of The Word Is Very Near You by Martin Smith. The chapter can be read on its own. Learn about some of the traditional prayers to Mary, including The Angelus, Alma Redemptoris Mater, and the Joyful Mysteries of the Rosary and how they can help deepen your experience of Advent. We will conclude this session by praying the Joyful Mysteries of the Rosary. December 10 - Operation Spaghetti and Meatballs. Meet at church at 5 p.m. to head to a local shelter to help serve dinner for 150 men and women. Please let Lyngine know if you would like to participate. December - Adopt-A-Family - Provide holiday gifts for a family in need. After Mass on Sunday, we'll be visiting the Fellowship Hall to select a family/family members. *If you know of other needs, please let Bp. Tim or Mthr. Lyngine know. Every Sunday 3:30 – 3:55 p.m.
We invite you to experience this sacrament this season and encounter God's healing love and mercy.